Winifred Lamb was recruited in the final stages of World War One for Room 40 in the Admiralty where she worked alongside (Sir) John D. Beazley. Her work there is discussed by me in the History Hit programme, “Archaeologist Spies of World War One“. Archaeologists excavated the ancient past during peacetime, but in war they had a different mission – to play a vital role in modern military intelligence. Historian of archaeology Dr Amara Thornton explores a network of archaeologist-spies, codebreaking, mapping and running agents, and with expert contributors delves into the extraordinary double lives led by the critical players in the international theatres of World War One. Lamb later worked as the Honorary Keeper of Greek Antiquities at the Fitzwilliam Museum, and excavated in Greece through the British School at Athens. Other members of the BSA also worked in intelligence during World War 1. They included David G. Hogarth, Alan J.B. Wace, Ernest A. Gardner, Harry Pirie-Gordon, and Richard M. Dawkins. Their work is explored in Sifting the Soil of Greece. Inchcolm Abbey was placed in State Guardianship in 1924. The remains was conserved by J. Wilson Paterson, the architect in charge of Ancient Monuments and Historic Buildings in Scotland. Paterson prepared the first guidebook in 1937; a second edition was published in 1950. It includes a fold-out plan of the abbey, as well as a series of evolving plans. The foundation was Augustinian, and was probably linked to Scone or St Andrews. It became an abbey in 1235. A new guidebook (‘Official Souvenir Guide’) was prepared by Richard Fawcett, David McRoberts and Fiona Stewart in 1989 and revised for Historic Scotland in 1998. This starts with a guided tour, and followed by ‘The story of Inchcolm Abbey and Island’. The history is taken up to the Second World War with the defence of the First of Forth. A new format souvenir guide was prepared by Kirsty Owen. The Solent provides access to the major harbours of Portsmouth and Southampton. Given the naval sensitivities of the area this seaway was heavily defended by a series of fortifications. The western entrance was defended by Hurst Castle built on a spit of land projecting into the Solent. The earliest phase was a Tudor fort contemporary with Deal and Walmer Castles in Kent. The castle was adapted in the Napoleonic Wars, and expanded in the 1850s, 1860s and 1870s. The English Heritage guidebook is by J.G. Coad. Yarmouth Castle is located opposite Hurst Castle on the Isle of Wight. This was also a Tudor foundation. The guidebook is by S.E. Rigold. Calshot Castle is located at the mouth of Southampton Water. This was also part of the Tudor defences of the Solent. During the First World War, Calshot became a seaplane base to protect against submarines. The guidebook is by J.G. Coad. On 14 December 1914 the German Imperial Navy bombarded the coastal town of Whitby. Part of Whitby Abbey was damaged. The First World War campaign in Macedonia uncovered a number of archaeological objects. The objects were collected in a museum. The members of the Royal Scots Fusiliers inspect an inscription of Manius Salarius Sabinus found near the ancient site of Lete. 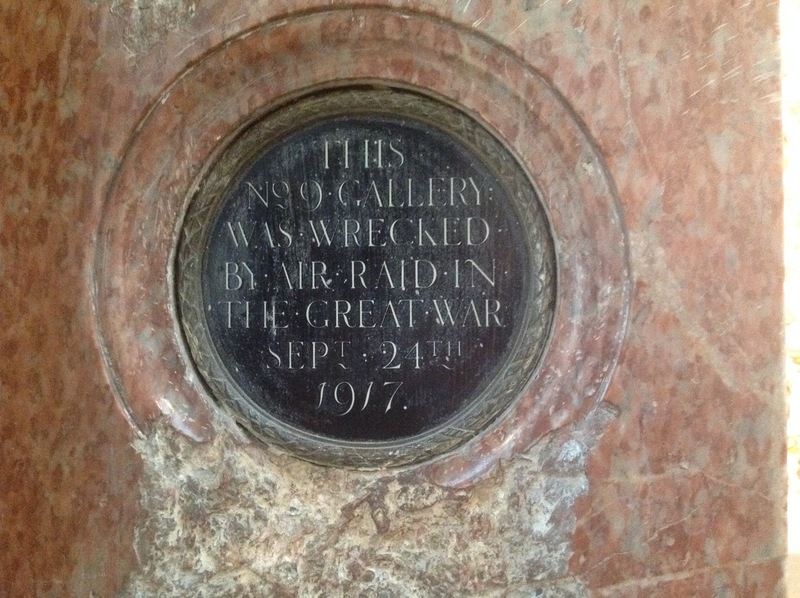 I noticed a sign marking the wrecking of Gallery 9 at the Royal Academy of Arts in London. The destruction had been caused during an air raid in September 1917. The Imperial War Museum has a picture of the destruction.